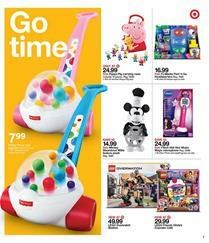 Cool toys, games, and table games are again on the Target Ad. Buy 2 Get 1 Free games, movies & books this week. You have pre-order deals on Anthem. It is a game published by Electronic Arts. You can fly with a jet suit and destroy thing which is really cool and also you can suit up like Iron Man in the game. That's my lame comment on the game but I am sure experts have better reviews on that. Go to pg 7 of the ad for LEGO Overwatch set, friends and more new products. Some of them are exclusive deals. Lol Surprise packs with new characters and exclusive deals are available on pg 8. You can buy Lol surprise hair goals pack for only $13.99! More collectible toys like Hatchimals, Fortnite 4-pk. figures, Savage World core figure, NERF Vortex pyragon and more can be interesting for toy lovers. LEGO Movie 2 toys are a popular section of all toy sales right now. More than that, Target Ad offers electronics, home and bedroom products, Love and Liberty Event, free gift cards for dozens of purchases and much more this week. Browse the ad preview, follow our Facebook page, share your opinion with us and save more.